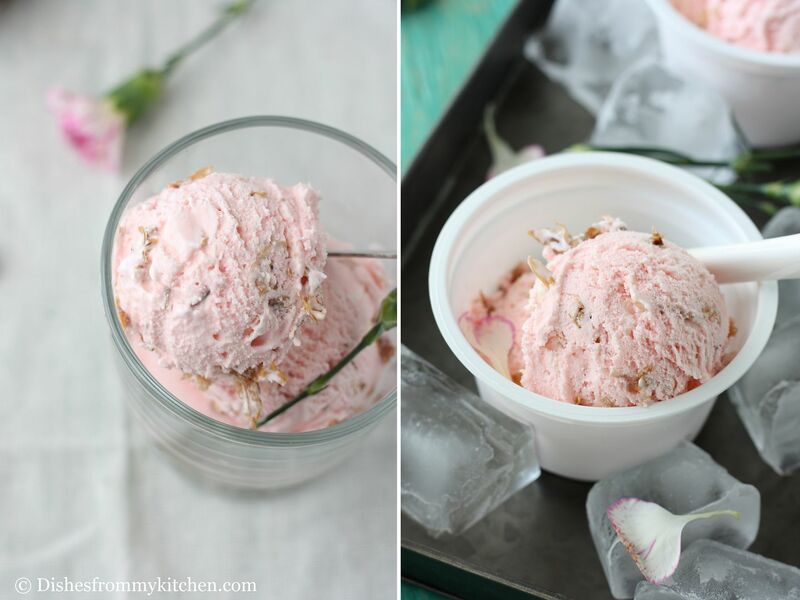 Dishesfrommykitchen: ROSE PETAL JAM ICECREAM / GULKAND ICECREAM - EGGLESS !!! 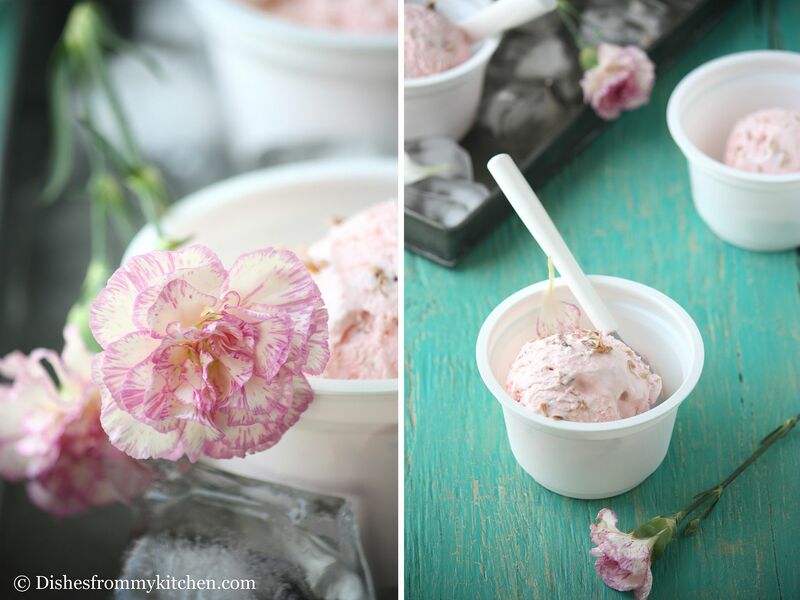 ROSE PETAL JAM ICECREAM / GULKAND ICECREAM - EGGLESS !!! Wish You All A Happy Tamil New Year and Happy Vishu ! Gulkand is a sweet preserve of rose petals. Gul means flower (Rose) and Kand means sweet (sugar). Gulkand is an Ayurvedic tonic and it is the most delicious Ayurvedic preparation known to mankind. The National Institute of Ayurvedic Medicine provides a list of the benefits obtained from eating Gulkand. This includes reduction of pitta and heat in the body, a reduction in eye inflammation and redness, strengthening of the teeth and gums, and the treatment of acidity etc. There are so many other medicinal properties for Gulkand. 1. It commonly used as an ingredient of Paan (Betel leaves), which is served after meal and claimed to be chewed as a palate cleanser, a breath freshener and for digestive purposes. 2. 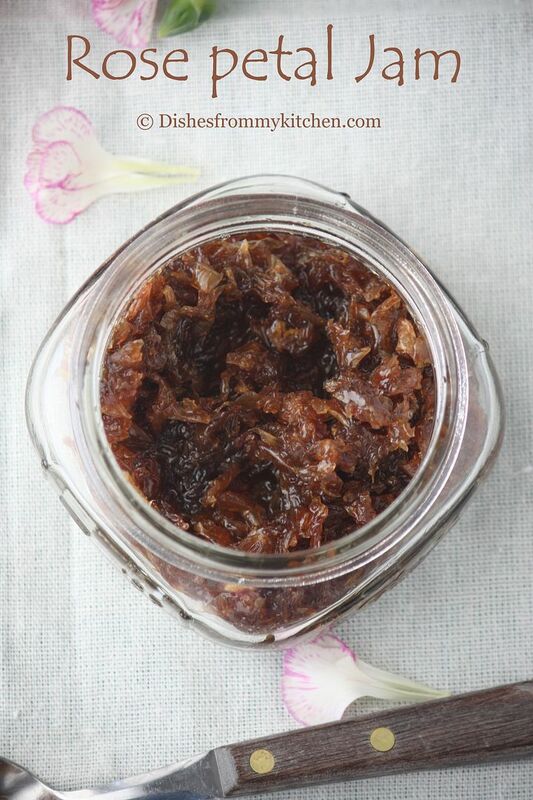 Because of its unique taste and flavor of the rose they are used for many sweet preparations. Back home in India, I use to have this Gulkand with Vanilla ice cream which tastes so yummy. 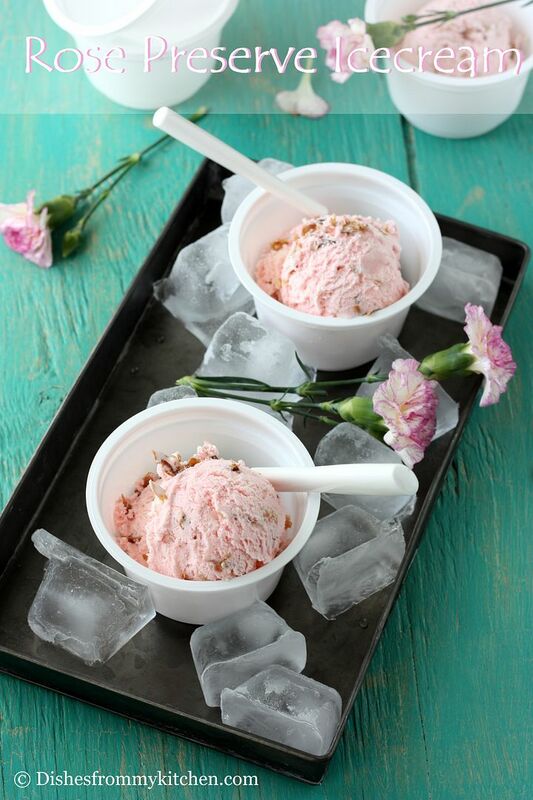 That is the main inspiration of this Gulkand ice cream and it tastes soooo fresh, aromatic and flavorful. 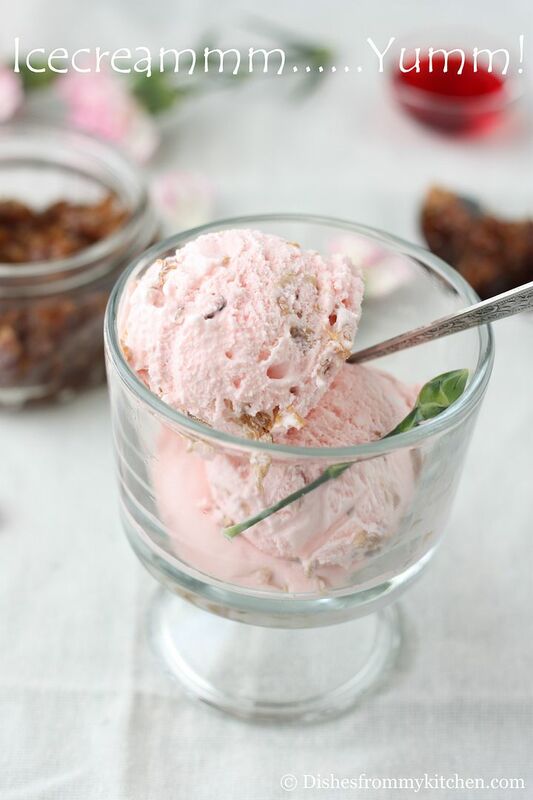 This ice cream is so easy to make and it is perfect dessert to beat the heat... We enjoyed licking the ice cream and I am sure you too.. I am glad to share that this is my first post with my new lens which I won here, thanks Siri :) . You not only did an awesome job, you also gave us a wonderful opportunity to help the cute little kids. 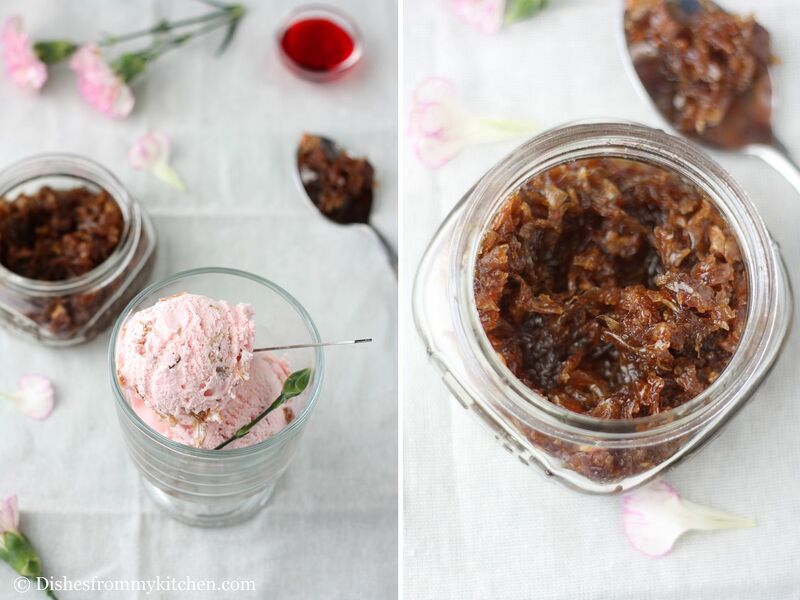 In this recipe I am using 2 important ingredients, off course one is Gulkand and another one is Rose syrup. You can buy this in any Indian grocery or even you can order through Amazon. Click here to see another Rose flavored dessert using the Rose Syrup "Jigarthanda - A popular one from southern part of India"
1. In a bowl whisk milk and sugar together until the sugar is dissolved. 2. Stir in the heavy cream. 4. When it starts to thicken, add the Gulkand and rose syrup. Once they are well blended and thicken further, transfer them to the airtight box and freeze them for another 2 hrs for scooping. 1. Follow the first 2 steps mentioned above. 2. Take a bowl full of ice cubes. 3. Keep the milk mixture inside the bowl filled with the ice cube. 4. Now whip it using electric egg beater until it is thicken. 5. When it starts to thicken, add the Gulkand and rose syrup. Once they are well blended and thicken further, transfer them to the airtight box and freeze them for another 2 hrs for scooping. Enjoy Home made delicious ice cream!!!! just very beautiful Pavithra! The gulkandh must render a lovely flavour and thefeel of the honey dipped petals in the mouth while the ice cream melts it's way must be worth anything! Yummmmmmmm! So pretty and summery and delicate. Absolutely delicious! 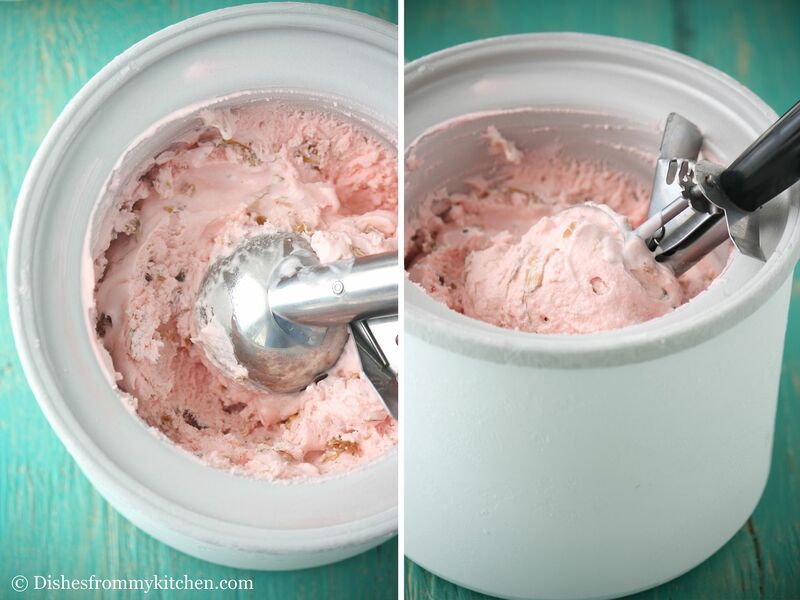 I so wanna buy an ice cream maker just to make this ice cream..adore gulkand!! Thanks for sharing this fabulous icecream Pavi, i brought a bag of gulkand from India, will try this soon.. Happy Vishu to you and your family. Ice cream looks simply awesome. Looks so beautiful. I love the green and pink combination in your photos. 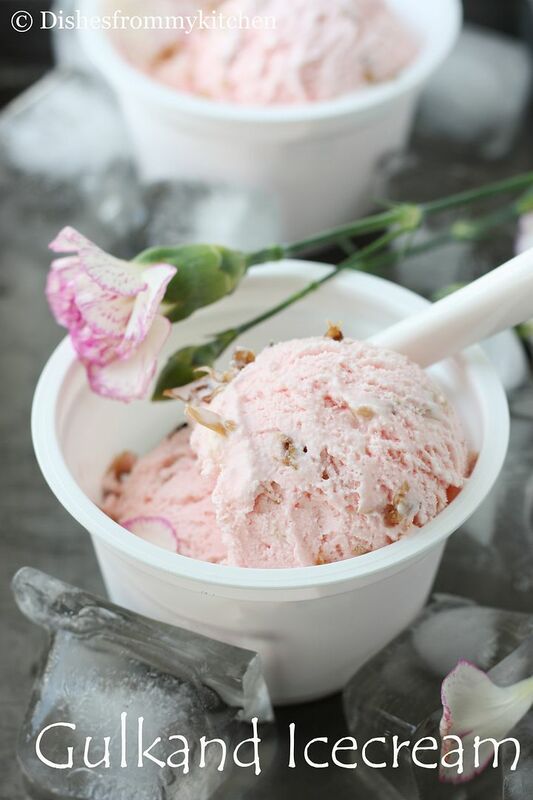 Rose petals ice cream looks delicious. Pretty pink! Who does not like Gulkhand and as an icecream flavour it must be amazing. Looks gorgeous,lovely scoops of ice cream. wow..ice cream looks just superb..beautifully presented!! what a nice recipe, the pink color is really gorgeous! I love Gulkand and can eat it as dessert on its own! 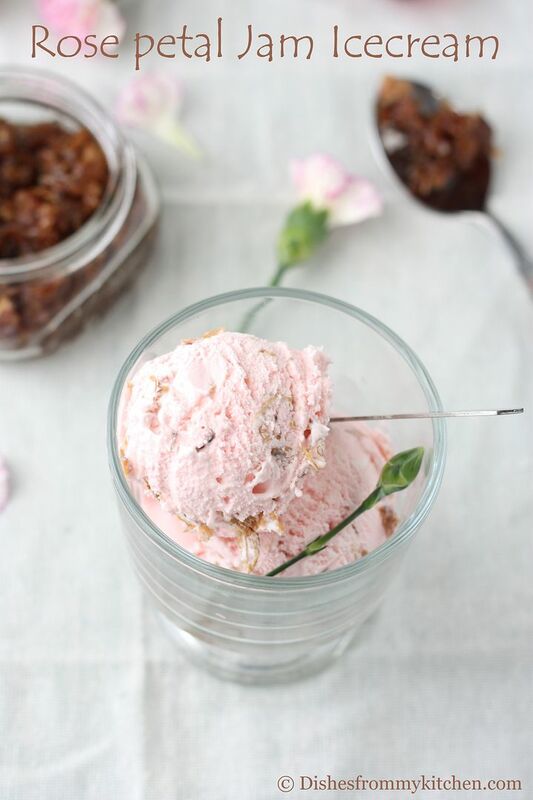 Ice cream with gulkand and rose syrup must taste delicious! Looks beautiful and really really inviting, bookmarked to try this summer! mmmm.... amazing clicks and lovely and delicious looking icecream. 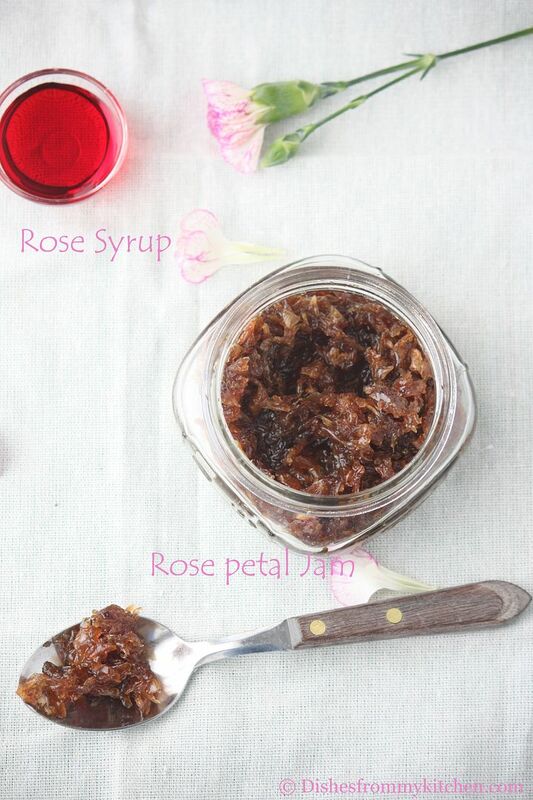 Friends actually tease me about my extreme love of Rose Petal Jam, so of course this recipe looks just heavenly to me! Thank you so much. Happy Vishu! Ice cream look gorgeous! Love the pink! I love this flavor very much...looks so delicious wid amazing clicks. What a beautiful jam and ice cream! These flavors are so elegant and refreshing, really wonderful! Superb Pavi... the other day I tried Gulkand with yogurt as lassi and was floored... I love this idea.. The icecream has a gourmet look and feel to it..